During the interwar period cinema and literature seemed to be at odds with each other, part of the continuing struggle between mass and elite culture which so worried writers such as Aldous Huxley, T.S. Eliot and the Leavises. And this cultural divide appeared to be sharp evidence of a deeper struggle for control of the nation’s consciousness, not only between dominant and oppositional elements within Britain, but between British and American vales as well. On the one hand, films like Sing As We Go, Proud Valley, and The Stars Look Down consolidated the assumptions about the existence of a national rather than separate class identities. On the other hand, working-class literature such as Love on the Dole articulated working-class experience in a manner intended to bridge the gap between the ‘Two Englands’. 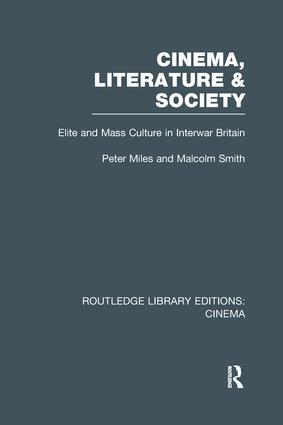 This book, originally published in 1987, examines how two of the most significant cultural forms in Britain contributed indirectly to the stability of Britain in the interwar crisis, helping to construct a new class alliance. A major element in the investigation is an analysis of the mechanics of the development of a national cultural identity, alongside separate working-class culture, the development of the lower-middle class and the implications of the intrusion of Hollywood culture. The treatment throughout is thematic rather than text-oriented – works of Graham Greene, George Orwell, Bert Coombes, Evelyn Waugh, the British Documentary Film Movement and Michael Balcon are included in the wide range of material covered.